German Thrash metal band Tankard have been going for 30 years now, and unlike many bands with such a long history, Tankard have been going continuously during that period. In that time they've released 14 studio albums, and are now ready to release album number 15. This will be their first album since signing with Nuclear Blast and is due for release towards the end of July. In case you've been living in a cave for the last thirty years and havent come across Tankard before then a short description is "alcoholic thrash metal". The music is good thrash metal, and the song titles/lyrics are alcohol related - even the band's name is linked to alcohol. So, alcohol and metal - sounds like a perfect combination to me ! The new album is called "A girl called Cerveza" (note the inevitable alcohol link), and consists of 10 songs with a running time of 50 minutes. Title track "A girl called Cerveza" is a very strong song and a video will be produced for it. There's a lyric video on youtube already - check out the Nuclear Blast channel and you can give the song a listen. A good catchy thrash song with plenty of power. "The metal lady boy" sees Tankard joined by Doro Pesch to do some guest vocals. Considering that this is not her usual style of music, it's amazing how well her vocals fit in with the song. Some great thrash metal from one of the mainstays of German thrash along with Kreator and Sodom. 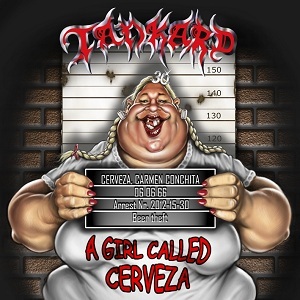 Tankard have released yet another great album and show no sign of slowing down. "A Girl Called Cerveza" will be released on 27th July 2012 via Nuclear Blast records.